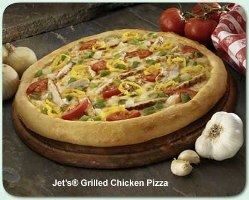 If you are looking for information on the Jet's Pizza franchise business opportunity, Jet's Pizza franchises or Jet's Pizza franchising, then you have come to the right place. 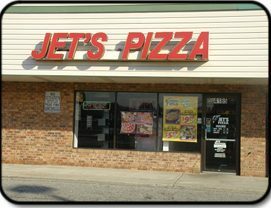 Jet's Pizza was originated in 1978 by Eugene Jetts, Jr. and John Jetts. Fourteen years later, a corporation was formed with James Galloway, Jr. and Jeff Galloway. The Jet's Pizza concept of franchising began in 1990 and has grown to more than 100 franchises throughout Michigan and Florida. We have been able to offer knowledge and expertise throughout the development of the Jet's Pizza System. Jet's has been selling pizza, submarine sandwiches and salads since the opening of the first pizzeria twenty five years ago. With our vast amount of restaurant experience, Jet's Pizza has had the opportunity to remain strong in an effort to provide our customers establishments that create a consistent look and provide top notch quality products. Due to our expertise, diligent hours of hard work and determination we have been able to offer our customers, quality products along with excellent customer service appreciation. We implement strong guidelines to achieve this goal. We use a set of criteria that includes essential timesaving and effective methods to make Jet's Pizza always taste consistent and extremely awesome. Our team will direct and offer assistance in many details of opening a pizzeria. We are able to provide continuing support along with an effort to streamline costs that are associated with opening pizzerias. Ask a franchisee and you will find that we are a hands on team and assist in every way possible. Many emails have been sent to our corporate office stating that customers who have tried our pizza can't wait until a Jet's Pizza arrives in their area. The market demands quality and we strive to give our customers what they demand. We are continuously called or an E-mail is sent in an effort to communicate that a great job is being done in meeting customer demands. We hope to continue to expand throughout the United States as long as prospective franchisees continue their interest in Jet's Pizza. Our system has been revised and updated and is consistent with the latest pizza trends today. We strive to bring our customers the best as they consume the traditional, superb, taste of quality products. This is satisfying as well as motivating and that is why we remain competitive in today's market. In our high powered daily lives how nice it is to know you'll be able to eat pizza that is of the finest quality and will measure up to your demands of the highest expectations. If eating good pizza makes you feel good you should try a Jet's Pizza. The demand for pizza continues to increase over time. Being The Future of Pizza is what it takes to be successful with todays' customers. Jet's strives to provide the public the best carry out pizza available today, so we constantly test different ingredients and baking techniques to live up to our claim as The Future of Pizza.